Earlier this week as I travelled to the BCSE Industry Awards, I flicked through the Evening Standard - as one does. 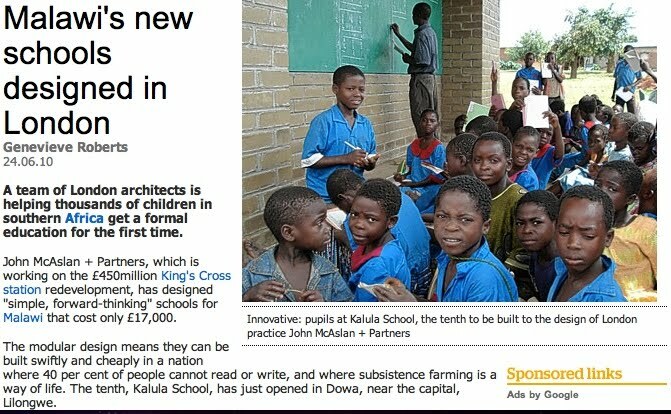 However this day I spotted a short article tucked right away in the middle pages describing how architects John McAslan + Partners were involved in designing small modular schools for Malawi. I just liked it! Modular means they can be built quickly and economically for a population often dependent on subsistence farming. Putting these schools in the heart of communities where they are needed opens up education for more of the local population. Being sensible of course, they can also be used in the evening to help educate the local community, farmers in new approaches to agriculture, sharing health education and so on. This is just a great project and one that I really support. With budget issues everywhere, aspects of modularisation will be being considered by many people here and abroad more and more. It makes sense after all economically. Sharing good practice and experience is what we all should be doing. It is also important, though, that the 'product' is modified to be appropriate for each of the local communities they are intended for - one size does not fit all even in this project. With increasing globalisation the world is 'getting smaller', we really do have a responsibility to offer to help those who want to increase their learning population.... A fab positive story - it's a pity it was buried so deep in the paper! To read the whole story by Genevieve Roberts, you can also click here.